Minister for Food, Civil Supplies, Consumer Affairs and Tribal Affairs, Chowdhary Zulfkar Ali called on Minister of State in Prime Minister’s Office and Development of North Eastern Region, Dr Jitendra Singh here today and discussed various issues of twin border districts of Rajouri and Poonch.The Minister raised the issue of Jammu–Rajouri- Poonch Railway line and said that railway connectivity is necessary for the development of the region and lack of development in Rajouri and Poonch is attributed to lack of rail connectivity.Briefing about the project, the Minister brought into the notice of MoS PMO that the Jammu-Poonch railway project was designed as a national project on 22nd March 2012 to be connected from Jammu Tawi Railway Station and Prime Minister during his visit to Poonch in connection with Assembly elections in 2014 has been very kind to announce construction of the said Railway line. He said that preliminary survey for Railway line was conducted by Northern Railway Construction Organization but no progress has been made on this project as on date.Raising the demand of four Lanning of Jammu- Rajouri-Poonch Road, Zulfkar said that Union Government in July 2015 approved construction of 08 new National Highways which include Jammu-Akhnoor-Nowshera-Rajouri-Poonch NH 144-A and the same project was included in Prime Minister’s Development Project announced on 7th of November 2015 and an amount of Rs 5100 Crore was earmarked for its construction.The Minister also demanded four Lanning of Rajouri-Budhal-Mahore-Ramban Road. He said that the areas of Budhal, Mahore, Gool remained neglected due to bad condition of roads. The Minister also raised the issue of construction of Budhal Shopian Road. “The Budhal to Shopian Road will provide connectivity to the people residing in Budhal and Mahore areas of Districts of Rajouri and Reasi”, he said adding “It will provide flip to tourism sector as there are a number of lakes and meadows falling along the proposed road”. He briefed that it has been proposed to construct 90 kms all weather road from Budhal (Raj Nagar) to Shopian for double lane specifications as per IRC and guidelines of MORTH. “The project estimates to cost Rs 305 crores may be completed in three years”, he said.Raising the issue of demining of Border areas & Permanent rehabilitation of LoC shelling victims, Minister said that Poonch and Rajouri remained a battle field of various wars besides this majority of the population of the area has been the victim of cross LoC intrusion, firing and shelling. “The mines network along LoC area has also lead to the loss of lives of the people and loss of movable and immovable property”, he said demanding demining of areas so that the people of border areas can use their land for agriculture purpose and loss of lives and property is brought down. 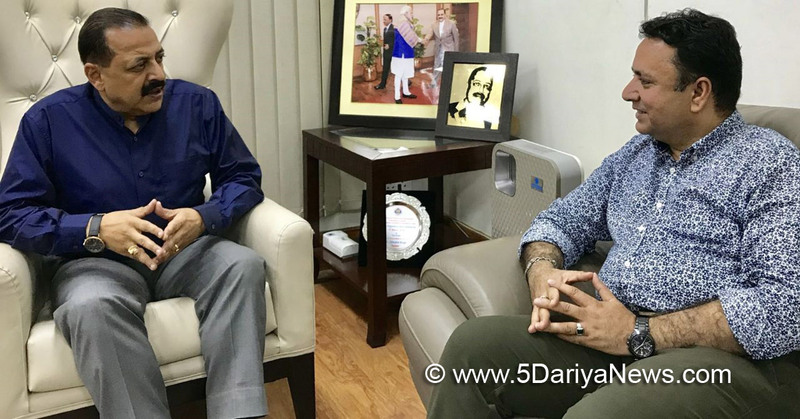 Terming air connectivity as vital for Poonch Rajouri, Minister said that in view of present security scenario, Air connectivity in the twin districts is necessary. He briefed PMO that Ministry of Civil Aviation has planned to construct Civil Airport in Rajouri, Surankote and Poonch but the work has not been started as yet. He demanded better Air Connectivity to Rajouri and Poonch districts with the rest parts of the state and country.Projecting the demand of Tunnel on Mughal Road, the Minister said that there is a need for construction of tunnel from Chhatapani to Zazinar which will shorten the distance besides will manage 12 month traffic on this important link.The Minister also demanded comprehensive project for exploring 7 lakes of Pir Panjal for tourism promotion.Expressing concern over snails pace of work on GREF Roads, the Minister brought into the notice of PMO that since Rajouri and Poonch are twin border districts and major roads are under the control of GREF (BRO) but there is no proper maintenance of these roads besides new projects taken up by GREF are also going on in snail pace. He said that some projects have been left midway while some roads are in dilapidated condition.Dr Jatinder Singh listened to the demands and assured the Minister that he will take up the issues with concerned and provide all support in mitigating all these demands.